Can I use the reheat method if I used the condensed milk and marshmallow cream to fix my fudge that is not setting firm enough. It isn't holding shape. I made two trays and hate to throw away. You can melt it and then stir in some powdered sugar. Or, you can melt it and stir in some additional hard chocolate. Or, call it "spoon fudge" and serve it by the spoonful instead of cutting it in squares. 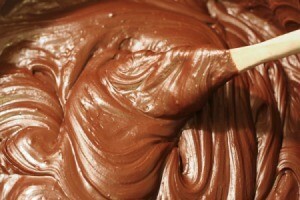 Or, melt it and use as a hot fudge topping on cake or ice cream. My fudge is too soft when I take it out of the refrigerator. Is it that I have used condensed milk instead of evaporated? Either you've added too much liquid or not cooked it long enough. There is "fudge repair' though you can try - All you do is add the liquid ingredients to a heavy pan and then the fudge - be it too hard or too soft and then recook it. Definitely use a candy thermometer and watch it closely. It is important to use a candy thermometer though and elevation can greatly effect how quickly it boils and the temperature it will rise. So if you are using a recipe that says "boil 5 min" that is probably the problem. Evaporated is milk reduced by half; that is if you want it the strength of regular milk, add the same amount of water; I'm not talking for fudge. Condensed is even more concentrated than evaporated, so even though they are both milk, they are usually used differently, and are not interchangeable for cooking.It is sweeter, partly because of the concentration, which concentrates the milk sugar in milk, but I think sugar is added as well. Condensed is usually used for desert type recipes. long enough, if it was the cooking kind of fudge. I would also think moisture/humidity of the air the day you made it might have affected it.